I've Caught Amor Deliria Nervosa! Lena lives in a world where love is a disease. At age eighteen, everyone is eligible (and required) to receive the cure. This operation leaves you unable to love, but it's also supposed to save you from a lifetime of misery. Ever since her mom's death, Lena has been desperate for the cure. As a consummate rule follower, she lives in fear of succumbing to the deliria. She carefully counts down the days until she can finally be safe. Everything is going according to plan until the day of her evaluation... and it's a day that could change Lena's life forever. She soon discovers that love is the deadliest of all deadly things: it kills you both when you have it and when you don't. I'm a little torn on this cover. I don't absolutely hate it, but I also wouldn't want to carry around a book with a giant face on it either. After seeing it in person, since I read it on my Kindle, I realized that it has a cool shimmery texture going on that is awfully fancy. I did like that! To me, this book says, "I'm a pretty girl offering you no clue as to what's inside." I would totally want to be Lena's friend! When we're first introduced to her, she's a total rule follower. Not going to lie, so am I. So I could totally relate to Lena's acceptance of the rules and desire to maintain order. She just wants to do what she's told! But then, with the help of her friend Hana (more on her later), she starts to question everything she knows. She starts to make decisions for herself and step outside the boundaries. And it was so fun to see her come into her own! Her hesitancy and her fear make sense the more you learn about her history, and her growth into a strong and confident women made for a really great read! You better believe I'd want to be friends with Lena in real life! I just hope she'd pass a little of her rebellion on to me - I still tend to freak out about breaking any rules (aside from the speed limit). Lena's discovery of love is absolutely enchanting. Because she's had no previous experience, her feelings and interactions can be magical in their newness. She's falling for a brave and attractive boy - and you will, too. She falls for someone in a real and honest way. There's attraction almost immediately, but her feelings develop realistically. In a book about love being forbidden, I appreciated that it's development felt authentic and believable. Oliver is such a great writer, which is what sets this book apart from so many other similar books I've read recently. She truly has a way with words and keeps you coming back for more. Even in the beginning, when the story moves a little slowly, you can't stop turning the page. I am absolutely in love with writing that is descriptive and love while still keeping the pace pitch perfect. The action really picks up about halfway through. At that point, you've had a chance to really get to know Lena and understand how she thinks. I loved that Oliver pays enough attention to her characters. They're actually developed (which is something that I've had problems with in a few YA books I've read recently). I loved that the characters and the plot were both so integral to the story. Oliver gives both their due and doesn't neglect either. That's really what makes this such a good read! You know a book is well-written when the characters are developed and the plot is engaging. I always excited when I find a book that meets both criteria! I've had some great experiences with dystopian fiction, as well as some less than stellar ones. Thankfully, this book is a shining example of a fabulous dystopian world! And by fabulous, I don't mean I'd want to live there. I just mean I loved living there through the pages of the book. One thing I really loved, and noticed more the second time around, were the quotes at the beginning of each chapter. Lauren Oliver acquaints you with the new world by giving you snippets of nursery rhymes, "biblical" passages, The Book of Shh, instructions regarding banned words and ideas. Since the novel is written in the first person, this really helped you get a feel for the world at large. And it was such a nice way to give you a really good idea of the environment in this new society without spending a lot of time describing it. I really enjoyed Lena's best friend, Hana. She's the person who first starts questioning the society, and it's her actions that prompt Lena's own. I loved finding out that she befriended Lena years ago when everyone else judged Lena for her mother's actions. *I wrote this like two weeks ago and have read Pandemonium since then... and I NEED BOOK THREE RIGHT NOW! "It’s strange how I instantly recognize the voice even though I’ve heard it only once before, for ten minutes, fifteen tops—it’s the laughter that runs underneath it, like someone leaning in to let you in on a really good secret in the middle of a really boring class." Bottom Line: Get it Right Now! The first time I read this book I picked it up from the library because I was unsure of whether or not I'd enjoy it. At that point, I hadn't read anything by Lauren Oliver and had no idea what to expect. Since then, I've actually purchased a copy for myself and have read it a second time. This was a book that actually got better with a second reading. I was able to appreciate details I'd missed the first time around, including some of the world building aspects. So, bottom line: stop reading this review and book buy this book! 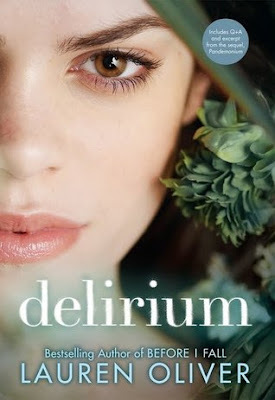 Oh, I like that Delirium gets better with a second reading. I mean, I liked it the first time around, but I like when books have re-readability. And word, I am a total rule follower too. YES. We rule followers need to stick together. However, I've found that I always need to be friends with at least one rule breaker because sometimes I need someone to make me cut loose and not be a goody two shoes ha!